Adam Brown goes face-to-face with the Diablotin. Biologists from EPIC and the Forestry, Wildlife and Parks Division of Dominica’s environmental ministry teamed up in January 2015 to do a systematic survey of the entire island of Dominica to locate Diablotin and determine its status. The Diablotin is a very difficult bird to study, as it is a seabird that comes to shore only for a few months of the year to breed, flying into forested mountains at night to underground burrows. A portable marine radar array and night vision scopes allowed biologists to locate, identify and count flying petrels in in the dark. This technique was developed and used successfully to study Diablotin on Hispaniola. 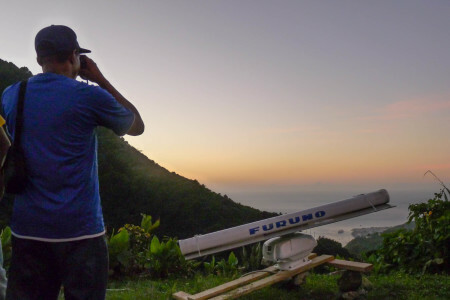 Team member Arlington James during a radar survey on Dominica. The next step is to confirm breeding by locating active nests. The team is confident that petrels observed on Dominica are breeding but the discovery of birds, eggs or chicks in burrows would make their presence a certainty. Biologists will make expeditions into the mountains in early 2016 when breeding petrels are expected to return to Dominica. Dominica’s forests, many pristine due to strong protections, would appear to offer prime nesting habitat to petrels, but also make locating burrows a challenge.The Diablotin is considered one of the world’s rarest seabirds with an estimate of only 1,000-2,000 pairs remaining, and until recently, known to nest only on the island of Hispaniola (comprising the nations of Haiti and Dominican Republic). 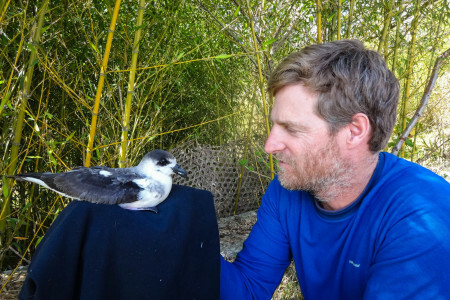 Biologists and others, who have formed an International Black-capped Petrel Conservation Group, held out hope that the species persisted on Dominica, buoyed by occasional findings of adult birds on the ground in coastal or inland areas. However, numerous searches to find evidence of nesting of this species on Dominica during the second half of the 20th century were unsuccessful. The dramatic re-discovery of Diablotin on Dominica gives that nation a huge role in securing the future of this species.